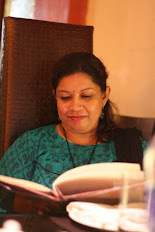 in North Indian recipes, Paneer, Veg. My daughter is an absolutely Paneer freak, so much so that if she could only eat paneer, that'll the best for her. So, I am ought to prepare something with Paneer atleast twice a week. To add Mushroom in her diet, I thought to prepare this combo and it was loved by everyone in my family. 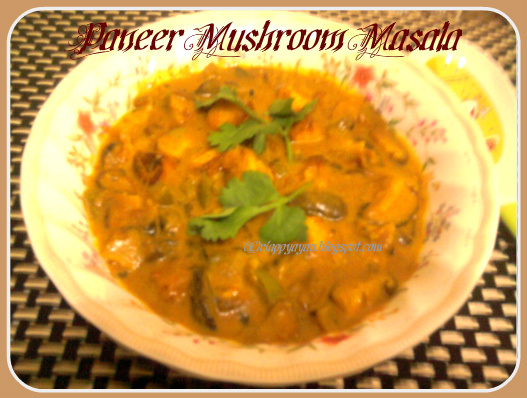 Paneer and mushroom combo work really well. Earthy flavour an meaty texture of mushroom and chewy texture of fried paneer are absolute heavenly combo. Paneer and mushroom simmered in a tomato-onion based creamy gravy will just make your mouth water. I tried this healthy version of No cream no butter no loads of cashews, from Aipi of US Masala and Now it has become our family favorite. I followed most of her recipe, but changed here and there for experiment purpose, like instead of yogurt, I used milk and it also gave an creamy texture. In a frying pan, heat oil, add paneer pieces and shallow fry them until golden brown from all sides. Take them out on a kitchen tissue to absorb extra oil. In the same frying pan, add cumin seeds. When seeds splutter, add chopped onions. Saute till they are golden brown, add grated ginger and garlic or ginger-garlic paste. saute for another 1 minute, then add chopped tomatoes and mushrooms. Stir fry till tomatoes become pulpy, add tomato paste/puree and all powdered spices except Garam masala. If needed add a tblsp of water and mix nicely and cook until oil seperates. Add cashew nut powder, garam masala and kasuri methi. Season with salt and sugar. Mix well. Add paneer and giving it a good stir mix well with the spices. Then add milk and stir for another 2-3 minutes. Then add about 1 cup water and let it cook in low flame for 5-6 minutes. When you have a thick creamy gravy, remove from fire. Sending this side dish to Charitha's "C for colorful currys"
Labels: North Indian recipes, Paneer, Veg. my daughter is same too..love this recipe..
love this masala.. goes well with roti or even rice.. yumm... very tempting..
Hi dear- this dish ia favorite in my family, I am glad it was well liked by your family too :) Thanks you for your kind words. 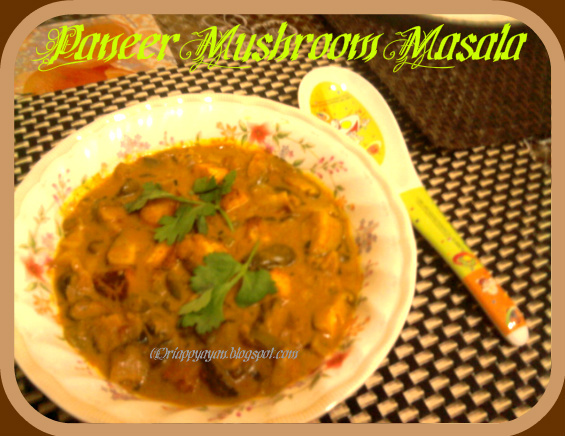 I believe you have done a wonderful job here..
Paneer mashroom masala looks delicious. It goes well with roti or paratha. Paneer and mushroom wow! mouth watering combo.